When we are young and healthy, developing a UTI is usually not a big deal as our immune system will take over fighting it off. Have you ever wondered why some people seem to stay slim and never gain weight? Are they born that way or do they know a secret to keeping weight off you don’t know? Scoliosis is an abnormal curve in the spine or backbone with most causes of it being unknown or idiopathic. This process helps regulate the level of glucose in the bloodstream, preventing it from reaching dangerously high levels (hyperglycemia). You’ve been having issues with your teeth. Maybe tooth pain, a chipped tooth, or bleeding gums. But, like many of us, you put off the obvious – a trip to the dentist. All of us have experienced illness from bacteria that can cause a sore throat or bronchitis. Usually after a few days of antibiotics, the symptoms of these illnesses disappear and you feel fine. Facts don’t lie and when it comes to women and their hearts, knowing the truth can be like holding up a mirror revealing what is really going on inside. Should you be screened for chronic kidney disease? Being told you have developed chronic kidney disease may come as a big surprise. Do you have a certain disease(s) putting your kidney’s ability to filter out toxins in jeopardy? Feeling weak, tired, or drained? One possible reason could be a low red blood cell count. When you have a lower red blood cell count than normal, your body has to work overtime to get enough oxygen to body cells, which can leave you feeling extra tired. The most abundant cells in human blood are red blood cells. These cells contain hemoglobin which is an iron-rich protein giving blood its distinctive red color and is responsible for carrying oxygen in the blood throughout our body. The red blood cells also helps remove carbon dioxide from the body to be disposed of. Red blood cells have a lifespan of about 3 months in which they wear out and die. But they do get replaced since our bone marrow continually makes more red blood cells. 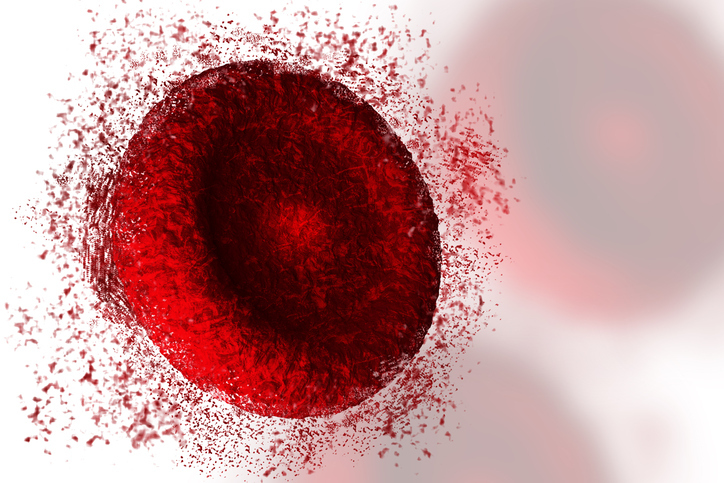 What is a normal red blood cell count? A normal red blood cell count can vary from around 4.7 to 6.1 million cells per microliter for men and 4.2 to 5.4 million cells per microliter for women. For children, the normal count is 4.0 to 5.5 million cells per microliter. These ranges can vary from person to person, and may also change depending on the lab that is doing the tests. Having a low red blood cell count can be due to several reasons such as bleeding and hemorrhaging, malnutrition, bone marrow failure, or overhydration. This can result in anemia causing symptoms such as fatigue and weakness, dizziness, shortness of breath, or heart palpitations. Anemia is when your body produces too few red blood cells or each cell contains too little hemoglobin. The most common type of anemia is iron-deficiency anemia. If left untreated, it could possibly lead to serious complications. When our red blood cell count slips, one of the best natural ways to correct this is to consume more nutrient-rich foods giving our body the tools necessary to make more of them. You could take a vitamin-mineral supplement but our body absorbs nutrients best when they come from eating food. From time to time, all of us may have digestive discomfort. As unpleasant as tummy troubles can be causing us to want to avoid food, we have to eat in order to live. For an organ we rarely think about, the pancreas can have its share of problems. When troubles do arise, evaluating pancreatic disease can be difficult due to the inaccessibility of its location in the body. Just when you lie down to get a good night’s sleep, your legs decide differently. From uncontrollable twitching to unintentional kicking of your bedmate, the rest of your body shouts “settle down” while your legs want to keep moving. All of us have heard of hepatitis but may have little knowledge of what exactly it is. One of the most popular elective surgeries in the United States is LASIK (laser-assisted in situ keratomileusis) surgery. All the physical touching, hugging, and endorphins being released bring health benefits to all of us. Metabolic syndrome is not a disease but rather a cluster of risk factors to help identify individuals who are at an increased likelihood of developing chronic conditions such as type 2 diabetes, heart disease, or stroke. Male mice fed a diet fortified with 10.5 percent walnuts had the greatest decrease in developing colon cancer compared to mice not fed walnuts.